Geographical overview of Qinghai Province (East Tibet) in West-China with the main regions, population centers, lakes, landmarks, monuments and scenic sights. There are but 16 museums in Qinghai Province. The Top Tourist attractions of Qinghai Province are considered to be the Ta'Er (Kumbum) Monastery, The Dongguan Great Mosque of Xining first built in 1379 AD, the Giant Qinghai Lake which lies only 100 kilometers west of Xining, and the natural sceneries of the Province among which first and foremost the Mengda Nature Reserve. Next in popularity are the various minority communities near Xining and in South Qinghai Province. There are however many more smaller worthwhile things to see and places to visit. Much less talked about let alone highlighted or visited are the remnants of The Great Wall of China in Qinghai Province. Chinese Military strongpoint since the 16Th Century, the main defenses of entire West China centered on the City of Lanzhou more to the East on the Yellow River. The City of Xining is the largest City in Qinghai Province and traditionally the focal point of Han influence in Eastern Tibet (now Qinghai Province). 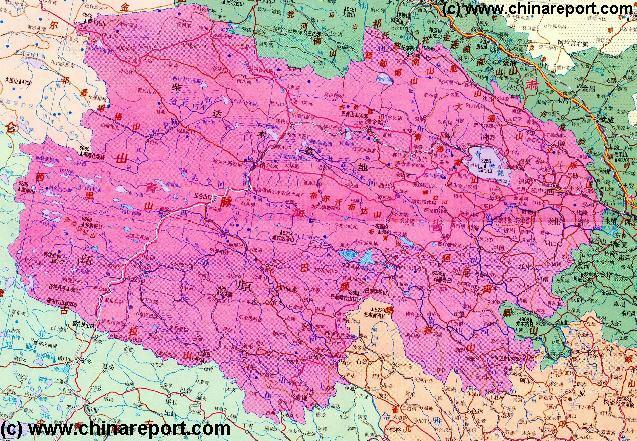 Today it is well connected City served by both the Tibet (Qinzang) Railroad and the Xining Caojiaba Airport. More and more foreign travelers pass through Xining. Although the City counts well over 1 million citizens Xining is a fairly unremarkable place. There are but a few historic monuments in Town and entertainment is not abundant. On the other hand there are many markets providing for a vibrant streetlife in Town. The largest of these markets is the Shujing Xiang Market found near the West Gate (Xi Men). The main historic landmarks of the City are but Three. These are the Great Mosque of Xining, the Beishan Si or North Mountain Temple and the various markets which reflects the customs cultures and needs of the Local People, many of whom are of minority origins. The Great Mosque of Xining was founded in the early years of the Ming Dynasty Era (1368 AD - 1644 AD) , after the defeat of Yuan Dynasty or Mongol loyalist armies in the region in the aftermath of the fall of the Mongol Yuan Dynasty (1271 AD - 1386 AD) in China. The original Mosque was constructed on Han Chinese orders as as a gesture of appeasement from the Han to the Muslim Tribes of this specific region. With their allegiance sorted, these ethnic groups were officially included within China and allowed to stay and graze their herdes on the mountain slopes of Qinghai and along the Hexi Corridor of Gansu Province, just inside the protection of the Great Wall of China. In the centuries that followed they settled in these remote regions, keeping much of their own culture and identity. Their descendants can still be found living in the mountainous regions surrounding the Capital of Xining. Beishan Si is of far lesser historic significance and is mainly known for the excellent view of the City to be had from the North Mountain. The Fifth popular scenic location to be visited in the 'vicinity' of Xining is the Mengda Nature Reserve. This destination lies at some 190 kilometers from Xining. A proper visit requires a long day-trip and possibly a stay-over for an in-depth experience. The main attractions of the Park are found not only in the natural scenery surrounding the Tian Chi - 'Heavenly Lake' but equally in the presence of the Sala, or the Salar Minority Peoples as well as the nearby flow of the Yellow River (Huang He). In fact the route to Mengda Nature Reserve leads along the gorges of the Yellow River and other spectacular sights. The Lake Tian Chi is a native home of the Sala(s) who revere it as their God, and is considered equally by local Tibetan Buddhists. Travel comfortably from Xining to Xunhua from where the journey continues for 1 and a half more hours to the Town of Huang He (not to be mistaken with Huanghe in Central Qinghai near Madoi, known as the source of the Yellow River) by Bus or Car. The Bus stop is at the Town of Huanghe from where it is another 4 kilometers walking to the Gate and Ticket Office. Travel the length on foot or succumb to the persistent offers for riding animals from the local peasantry. Once inside the gate there is yet another exhausting but spectacular one hour hike up to the Lake. Once at the Lake one can enjoy a rest at the Lake Shore or walk around the Lake, climbing peaks overviewing it in turn. After an exhausting hike one can return to Huang He Town to get a taste of Sala Culture, however the village should be counted as an attraction by itself. Those who, not surpisingly cannot muster the energy can stay over and explore the village another day. Noteably, busses pass through Huang He village on the way to Dajehe Town, from where a connection can be made to Linxia , an autonomous Hui enclave and Garrison Town just across the border in Gansu Province and only a short hop from Lanzhou, the largest City in Western China. The sixth last but certainly not least important scenic site and historical monument in Qinghai should be considered the Great Wall of China built along the eastern rim of the Tibetan Plateaux. These sections, not much published on and apparently unvisited today were originally constructed during the Ming Dynasty, when a The Great Wall of China reached it highest state of development. Although the main defenses of this very large region faced Northward and Westward and were formed by the main outer line of the Great Wall which runs North of Lanzhou and along the northern edge of the Hexi Corridor, additional sections were built west of Lanzhou and East of Xining, mainly in order to prevent an out-flanking maneuver of the Main Defense Line and Force. There was however also a deeper hidden motive behind its construction. Although at the Time of the early Ming Dynasty (1368 AD - 1644 AD) the Tibetans had accepted allegiance to the Chinese Imperial Throne in Beijing and posed no threat, earlier during the advance of the Mongol Armies on China preceding 1271 AD and the establishment of the Yuan Dynasty the Tibetans had been close to signing allegiance with Genghis Khan and his now infamous Mongols against the Han Chinese. The only reason the alliance failed to materialize was because the Lama sent as emmissary from Tibet fell ill at about halfway the way to the Mongol Court and died at Lanzhou. After taking subsequently taking the City from the Han Chinese, the Mongols even erected a Dagoba Monument to commemorate the dead Lama-messenger. The monument still stands today overlooking the Yellow River and the City of Lanzhou and reminding those who understand of the significance of the Moment. Most tourist do not seem to get this deeper meaning, however. Not in the list of tourist magnets but certainly worth a mention is the flow of the Yellow River through Qinghai Province. Although the source of the Yellow River, China's second largest, lies amid rough terrain in central Qinghai Province far from Xining the flow of the mighty and famous river can be reached from Xining. In fact. A visit to the Yellow River could combine well with a hike into Mengda Nature Reserve and a visit to its Heavenly Lake. Read all about the Landmarks, Monuments and Scenic Sites of the North-Western Regions of Qinghai Province - Click Here !! Another reason may lie in the Ethnic Tensions with the Tibetan Minority within The Peoples Republic of China, which occassionally sweep the Region. Tensions have been rising between various Ethnic Groups in the West and in other parts of the country. The ethnic groups involved are mainly the Hui(hui), the Tibetans and the Uygurs, who agitate against the Han immigrants to the Region (and their peers in Government) as well as against each other. In order not to further feed discussions on the Independence of Tibet from The Peoples Republic of China, the Great Wall of China sections within eastern Qinghai designating an ancient border with the Tibetan Territories may go under-advertised. The Great Wall of China reaches its Highest Point somewhere between Lanzhou, the Capital of neighboring Gansu Province and the City of Wuwei (Liangzhou) in the Hexi Corridor in Gansu Province, due North of Xining. Around the City of Wuwei many remnants of the ancient Great Wall can be found (Read: Wuwei Report-section). From the 3000 meter high pass south-east of Wuwei the 'Tibetan Curve' of the Great Wall of China heads south and up over high mountains onto the Tibetan Plateaux to the regions near Menyuan and the Town of Datong. Today, these regions are recognized as part of Qinghai ProvinceMongolian Ethnic Area's, to the East lie the inner-lands of China, and to the West lies what can be called 'Tibet'. Hence, the presence of Chinese Defenses through the Regions. This particular section is the Great Wall of China marking the official border with the Tibetan Territories since the Tang Dynasty (618 AD - 907 AD) (intermittently) under autonomous rule of the 'Kings of Tibet' (as they are known in China today). Nothing much is known or reported on the Great Wall of China remnants near Menyuan and Datong, nor are there any organized tours or guides. The Wall sections however do exist today as described in an offcial University Study (:'Chen Rong 陈荣, 'Datong jing nei de Ming changcheng kaoshi' 大同境内的明长城考释 (A study and explanation of the Ming Great Walls in Datong [Qinghai Province]), Qinghai minzu yanjiu 青海民族研究 (Nationalities research in Qinghai), 2002:3, pp 64-65.'). Thus, the Wall also served as a back-up just in case the Tibetans would change their minds later and turn upon their nominal masters. 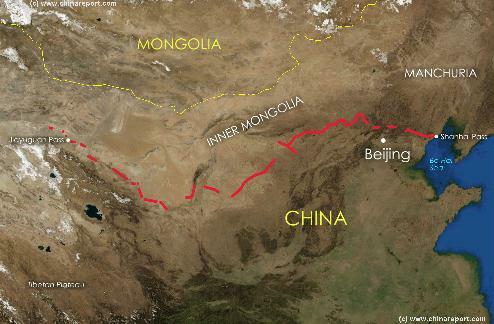 As briefly mentioned, the Great Wall of China in Qinghai Province is not part of the main defensive line that has been so hailed by many throughout the centuries. The Wall, of which remains are located somewhere between Xining and Lanzhou should be regarded as only of secondary importance, perhaps this is one reason why it goes nearly unmentioned today. Tibetan Government in Exile) the Great Wall of China then describes a curve around to the West, enclosing not only regions traditionally inhabited by Huihui (muslim) Tribes as well as Mongolian Tribes, but also today's Capital at Xining. Naturally, there are very solid historical reasons for this. During the Ming Dynasty the Great Wall was a very real defensive asset against various untrustworthy Tribes. Among these were various groups, who, given enough provocation, could ally themselves and fight against the Chinese. To adequately protect the Western Gate into China, not only need the whole Hexi Corridor be secured, the bypass-routes over the Tibetan Plateaux best be plugged as well. 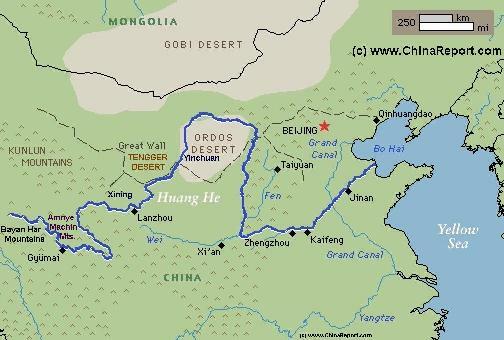 The reason to include the Huihui Territories within the Great Wall of China did not lie so much in the fact that the Huihui were regarded 'more Chinese' and better more trustworthy allies, but was done in order to enable control over the grazing lands of the Eastern Qinghai Plateaux. These were vital to the Ming Armies as they provided ample grass and many horses. 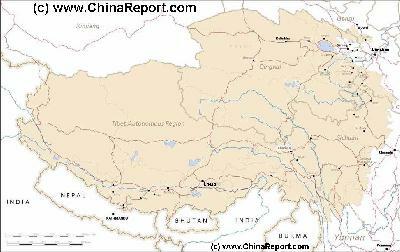 Furthermore, keeping on these regions provided the Ming with a foothold on the Tibetan Plateaux, territories that had been subjected earlier during the Tang Dynasty (618 AD - 907 AD) and had been part of the perceived Han Chinese Realm. The Huihui more or less provided the leverage for control over the others. against the others, thus always keeping the upperhand in the settlement of Xining and the Koko-Nor regions. Even during the 19Th Century and as late as the early decades of the 20Th it was regarded disputed territory. To give an example, when the first European Explorers of that Era explored the Tibetan Plateaux, they found that the Ethnic Group in charge of what today is (roughly) Qinghai was under the administrative control of Mongolian Tribes. And this was only the practical situation on the Ground. In principle, at least until 1911 AD, the territories were nominally part of the Qing Dynasty (1644 AD - 1911 AD) Empire and Realm. The Ching had merely relegated their responsibilities to their Mongolian Allies. However, as Foreign Nations had fallen upon China, there were plenty of Mongolians who regarded these remote lands as fallen out of their grasp, and thus reverted back to Mongolian and Mongolia. To further complicate things, after 1912 AD, the Tibetan Court or Government in Lhasa had distanced itself from China's First Republic after the coup by Yuan-Shi Kai henceforth declaring (mainly to its secluded self) its Independence. From that day on there were in fact 3 claiming parties. The closest historic and cultural destination to Xining is the Kumbum Monastery, known in Chinese as Ta'Er Si. The Kumbum is a Buddhist Monastery that is important and interesting for many varied reasons and is known throughout the world, mainly because of its religious function as the second of the six important Monasteries of the dominant Yellow Hat Sect of Tibetan Buddhism-Lamaism. The Yellow Hat Sect is the 'ruling' sect to which belong both the Dalai Lama and the Panchen Lama. That said, there are however many histories and tales attached to this large Buddhist Monastery in Qinghai all reasons that draw the crowds to the Kumbum. First and foremost the Kumbum Monastery is one of only 17 surviving original Tibetan Monasteries in the World. Until roughly 1949 AD and the establishment of The Peoples Republic of China there were an estimated 3800 Temples and Monasteries within (U-Tsang, Amdo and Kham Provinces of) Tibet, however -for various reasons- nearly all of these were wiped out during the 'Peaceful Liberation of Tibet' which started in early 1950 AD with a 20.000 Men strong invasion and some ways is still in progress today. Of the 17 surviving Monasteries, the Kumbum (Ta'Er) Monastery and the Labrang Monastery are the only ones surviving within Qinghai (formerly: Amdo). Hence, the Monastery is a unique Architectural Wonder and lovers of original Tibetan architecture and those creeping of the Tibetan past, culture and religion can be well accommodated at Kumbum. They flock there in increasing numbers. Another reason for the high name of the Monastery is found in the fact the the name of the 14Th Dalai Lama, a Man today regarded by many as the sole spiritual leader of all Tibetans, is firmly attached to the Kumbum Monastery. To be more exact, on July the 6Th of 1935 AD the village of Takster or Hongya Cun at only some 40 kilometers distance south of the Kumbum Monastery, saw the birth of one Lhamo Döndrub, who according to Tibetan Religious Beliefs was found to be the re-incarnation of the (13Th) Dalai Lama, a 'Living Buddha'. As described by the Dalai Lama's elder brother Thubten Dsjigme Norbu (recognized: Thakster Rinpoche, Rinpoche=reincarnation) the new baby was born into this world under the dim light of an oil lamp, amidst the animals in the farm sty. It was the traditional way. The young baby boy who was born that fateful night amid such humble surroundings lives today as Gyalwa Tenzin Gyatso or H.H. the 14Th Dalai Lama and is widely respected and revered by Tibetans and others around the World. The Tibetan Government in Exile is located in Dharamsala, North India. Thus, although the Dalai Lama has moved on long since, pilgrims who would like to follow the life-path of this acclaimed Holy Man can visit Kumbum Monastery and combine it with a visit to the birthplace of the banished 14Th Dalai Lama. Apart from these main well-known and popular places to visit in Eastern Qinghai Province in the Region of Xining there are a small number of other historic and interesting monuments which should be noted. Due South of Xining these are the Bainqen memorial Pagoda of Gonghe, the Hejin Mosque and the ethnic enclave Town of Guide, The Town Mosque of Hualong Town, The Kanbula Forest north of Jianca, the Longwu Temple south of Jianca, the Xihai Lake and the Wutun Temple of Tongren City. West of Xining in Ping'An travelers can visit the Qutan Temple which is also known as the 'Small Imperial Palace in Qinghai'. North of Xining are yet more sites and ethnic enclaves. The Northern Regions are the home of the Kazakhe, the Tu, The Yugur and the Dongxiang. Monumental sites include various temples and mosque reflecting the faith of the local ethnic group. These are in order of estimated distance to Xining the Youning Temple, the Guanghui Temple, The Haomen Mosque west of Menyuan Autonomous Township, the Baihu Temple outside Muri and finally the Gaggao Temple due north-west of Ganca Village. River, Sun-and-Moon Hill, and Longyang Gorge Reservoir of the Yellow River which is the largest artificial reservoir in China, and the Dulan International Game Land. There are three main scenic sights in East Qinghai Province. Two of these lie relatively close to the provincial Capital of Xining with its airport, the third -Mengda Nature Reserve-lies at considerable distance and travel time away from Xining and is far more difficult to include into a travel itenerary. Read all about the Landmarks, Monuments and Scenic Sites of the South-Western Regions of Qinghai Province - Click Here !! reaching some 6 meters in height along this particular stretch. What was dubbed the 'Tibetan Curve' by Geil, then leads further southward to meet up with the Yellow River which thunders through the Tibetan Plateaux at high speed presenting an impassable barrier at the thus historically famous Longyang Gorge. Thus a bypass of the Hexi Corridor defenses was effectively plugged. Today the Fourth Landmark and Monument to visit in the Xining Region the Longyang Gorge of the Yellow River is home to the largest man-made lake in China, the highest Dam in Asia, and the second largest hydro-electric power-station in China. In the past this is where the Great Wall of China defenses led back from West to East following the Path of the River. All along the Gorge, until as far as Lanzhou, small scale defenses and walls were set up at crucial points. In 2008, it was suddenly reported that 'recent investigations of the surroundings have found one hundred and twenty miles of Ming Great Wall west of the city (of Xining)'. Much of the wall is still in decent condition according to the few articles on the subject, and a second wall, a trench wall, is also found in the environs of Xining. It is possible that in coming years this portion of Great Wall will become better known and perhaps be restored, but for now its tourist potential, as its location, are remote. No instructions for finding the exact locations are available at this Time. Soundbonus - Buddhist Chant - 'Great Compassion Mantra'. By Unknown Monks. And as if this were not enough, even more famous names are attached to the Monastery. For a proper understanding of their stories however, it is necessary to first learn a little more of the high religious rank and historic significance of this place. As should be noted, in history the Kumbum Monastery was second in importance the Drepung Monastery in Lhasa (Tibet AR), which was for a long time the center of religious power in the Nation. The key of the Holy Status of the Monastery lie in its historic origins as it was built on the site of the Birthplace of the main inspiring figure of the Yellow Hat Sect, Tsongkapa 'The Reformer'. According to legend, Tsongkapa was born in 1357 AD under a Tree that stood on this location. Only a few years later the mother of Tsongkapa and some locals established a stupa in commemoration of the birth, providing a first recognizable Buddhist prayer site. The Monastery itself was only established much later, but on direct orders of no one else than Sonam-Gyatso, who today is recognized as the 3rd Dalai Lama, but who in fact was the First Dalai Lama. Great Merit". In addition an annual Prayer Festival (sMon-lam) was inaugurated to commemorate the visit of Sonam-Gyatso. This yearly Religious Festival is similar to the original (lost) one held in Lhasa. Afterwards which the complex grew into one of the main bastion of this particular line of thought. The Main Shrine Hall of the Monastery is a golden roofed Hall known as the Serdong or 'Golden Tiled Temple' throughout Tibet and Mongolia, which was supposedly built around the original Tsongkapa Birth-place Tree, since known as the 'Tree of Merit'. The Tree of Merit, as legend has it, sprang up on the exact spot where a drop of blood fell when the babies umbilical cord was cut. Several wild stories have been 'established' by western vistors as the the exact nature of- and the beliefs surrounding the Tree, but according to Heinrich Harrer none of the writers who have described 'the Tree' were ever allowed to see the real Holy Tree. The best description is thus derived from legend and holds that it is a sandalwood Tree that has 100.000 leaves that never fade and all carry the 'mark of the (Face o/t) Buddha'. When in bloom, its flowers spread a sweet seductive smell that is more fragrant then others. Supposedly the Tsongkhapa Tree enjoys everlasting life as well. Thus, from the Mind, Body and Idea's of Tsongkhapa grew a great religious tradition and a large Monastery which was the most important one in the Amdo Region. As a result of its religious importance several famous persons then passed through it or even lived there for some Time. The Kumbum Monastery was also the frequent residence of reincarnations of both the Dalai Lamas and Panchen Lamas. Such was also the case when in 1949 AD emmissaries from the Council of Khenpos identified another 'soul boy' to be living in the Amdo Region, the young boy who was then 4 years old, inevitably wound up at the Kumbum Monastery to be further examined by its Monks and Administrator. Interestingly, the Abbott of the Monastery at that Time was none other than Thubten Dsjigme Norbu, the elder brother of the (current) 14Th Dalai Lama. The Soul Boy and suspected incarnation of the Panchen Lama then became a Monk at the Monastery. Initially, the boy was to be sent to Tibet forthwith for initiations and enthronement, but regional, religious and even international politics intervened. It was only after several years in 1949 AD that the new 10Th Panchen was recognized as the legitimate and only reincarnation of the 9Th Panchen Lama (who died in Jyekundo, Amdo, Tibet in 1937 AD) and then only by an emmissary of the Chinese Kuomintang Government who nominally controlled the Kumbum Region in extreme East-Tibet through the Hui Ma Clique of Warlords. Factually, the 10Th Panchen was kept at Kumbum Monastery in a region well under Chinese Control for various political reasons. He was finally recognized by 'Lhasa' and thus by 'Tibetans' in the form of an agreement with the 14Th Dalai Lama in 1952 AD. Another great person who passed through the Kumbum Monastery, albeit only after Death, is Genghis Khan. In short, the Great Khan is supposed to have succumbed not very far from Lanzhou in south Ningxia Region near Liupan Shan (six Bends Mountain) or according to another version at Xinglong Mountain even closer to Lanzhou. It is said that after Genghis succumbed from his war-wounds acquired at the Battle of Khara-Koto (Heicheng), his corps and coffin were not returned to Mongolia but hidden for safe-keeping inside the Grand Buddha Hall of one of The Temples on the (Xinlong) Mountain. According to the Xinlong version of the legend, The Great Khan then lay there fairly undisturbed for centuries. 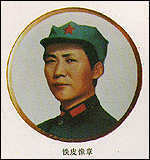 The situation supposedly remained unchanged and 'secret' until (the middle of) 1949 AD when his remains were removed and taken to Ta'Er Monastery (Kumbum Monastery) near Xining (Silung) in eastern Tibet (now Qinghai Province) for safe-keeping from the advancing and godless Chinese Communist Armies. At the Time the Kumbum Monastery and Xining Region fell under command of Warlord Ma Bufeng who had been handed the responsibility for a last stand against the Communists. During the Long March the Tibetan populace as well as the Hui Warlords of Gansu and Qinghai had fought the communist armies tooth and nail during their trek across the eastern end of the Tibetan Plateaux. Hence this move. In an even more interesting episode, only five years later when the Tibet was absorbed by The Peoples Republic of China in a short war, one of the first actions of the Chinese Forces was to reclaim the supposed body of Genghis Khan. According to the Chinese Government, the Coffin and Bier were then claimed by the Inner-Mongolian Authorities and taken to Ejin Horo Qi, where they now rest inside what is known as 'The Mausoleum of Genghis Khan'. Today however, no one believes this is the true corpse of Genghis and so the Quest to find his Tomb and remains continues. Today Kumbum Monastery is the main tourist attraction in East Qinghai Province, located at only 26 kilometers from the City near the village of Huangzhong, today part of Ping'An County of Haidong Tibetan Autonomous Prefecture (海东地区). In 1990 AD the monastery was nearly destroyed in an earthquake and the following heavy snows of an unusually harsh winter, damaging many of its buildings, however in the aftermath the Provincial Government provided funds for a nearly complete restauration of the entire complex. Eversince the Monastery with its unique Tibetan athmosphere has grown each year in popularity. Visitors to the Monastery are allowed to view 6 main Temple Halls of the Complex, but certainly not all of the buildings and halls. A great experience is the scenic clockwise around hiking Tour around the monastery guided by Buddhist Monks. Although no photography is allowed inside all Temple Halls, there is plenty to witness, see and photograph on each and every visit. The most special Day of the Year at Kumbum Monastery falls on the 15Th of the 1st (Lunar) Month, when it is the Festival of Butter Lamps is held. This practice, highpoint of the Monlam Festival, was halted during the years of the Cultural Revolution and the ongoing but badly progressing 'peaceful liberation of Tibet'. Read the Complete information on the Monument: "Kumbum Jampa-Ling Monastery - sKu-‘bum Byams-pa gling - (Ta'er 塔尔寺) (1) Introduction & Directions". YouTube Video: Scenery & Landscape of Qinghai Lake (Kuku Nor), China's largest inland Lake. The second scenic site to be found in the vicinity of Xining is Tso Ngon or Lake Qinghai in Chinese terms, the largest inland lake in China. The eastern shore of the Lake lies at only a 100 kilometers distance from the City making it a viable destination for a worthwhile daytrip. Schematic overview Map of Qinghai Province depicting main roads and rail-connections, main mountains and rivers, plus landmarks and locations of interest. species can be found and hopefully seen in relative abundance. The most famous viewing spot and breeding colony is Niao Dao or Bird watching island, which lies on the Western Shore of the lake at a far greater distance to the City, some 300 kilometers. Those who come to view the rare birds that visit the region do so mainly from May until early June during the breeding season. At other times wildlife is sparse, the birds have once more taken to the skies and visits are likely uneventful. Book a special bird-watching tour or make your own special preparations. Those interested in the wider regions of the bird lake can travel the distance of 100 kilometers to the historically famous Chaka salt know for its quality sodium deposit. The crude salt that lies in abundance at the lake contains more than 96% sodium chloride with few impurities and was traded by local Nomads and herdsmen to the Han as early as 100 BC. Chaka Salt Lake is 300 kilometers from Xining, the capital city of Qinghai Province, and 100 kilometers from Bird Island of Qinghai Lake, a national scenic area. The Fourth impressive and worthwhile Landmark and Monument to visit in the Xining Region is the Longyang Gorge of the Yellow River with its largest man-made lake in China, highest Dam in Asia, and the second largest hydro-electric power-station in China. 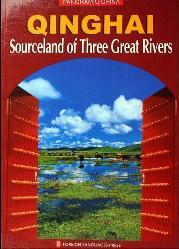 For Full Details on the Longyang Gorge and Dam, read 'Main Rivers and Waterways in Qinghai Province'. 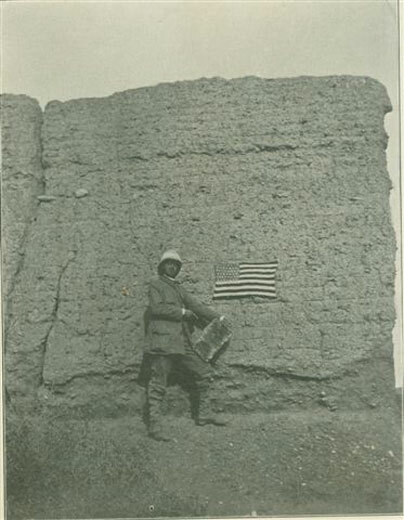 William Geil in full gear posing with an American Flag and an earthen (core) section of the Great Wall of China in 1908 AD. 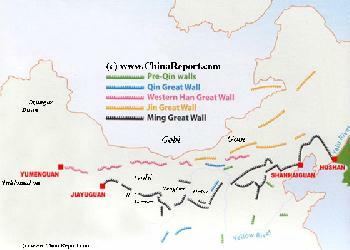 The exact locations of Great Wall remnants near and along Longyang Gorge and the routes to them are not clear. DrBen.Net & ChinaReport.com are planning an expedition to find out the necessary further information. Another very worthwhile site to visit is the Labrang Monastery, which is located on the border of Gansu Province and Qinghai Province near the Tibetan Town of Xiahe'. Xiahe' is part of the Gannan Tibetan Autonomous Prefecture of Gansu and is most easily visited from Lanzhou. As there was however an ancient Caravan- and Trading Route leading from Xining to the Kumbum Monastery and from there on to the Labrang Monastery, today a small Provincial Road still leads there. Buses connect to Xiahe' and Linxia in Gansu Province. The Labrang Monastery is another one of the six great monasteries of the Geluk (Yellow Hat) school of Tibetan Buddhism. It's large complex stands on the extreme eastern border of what once considered part of Amdo Province of Tibet. Today is considered the most important Monastery in East Tibet, home to the largest number of monks outside of Tibet Autonomous Region. Biography of the 14Th Dalai Lama elder brother and former Abbot of Kumbum Monastery by Heinrich Harrer!